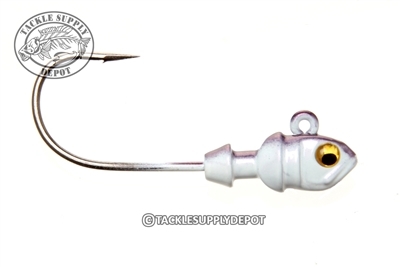 The TSD Tungsten Swimbait Jig Head offers a realistic touch to any soft body swimbait and is perfect for slow rolling bottom structure as well as pairing on an Alabama Rig to resemble a schooling baitball. The dense tungsten material provides a scaled down profile while retaining adequate weight for covering all depths. These heads are amazing. Durable as nails. Ive banged mine on docks and rocks over and over with absolutely no paint chipping. The realistic eyes are a must have! !